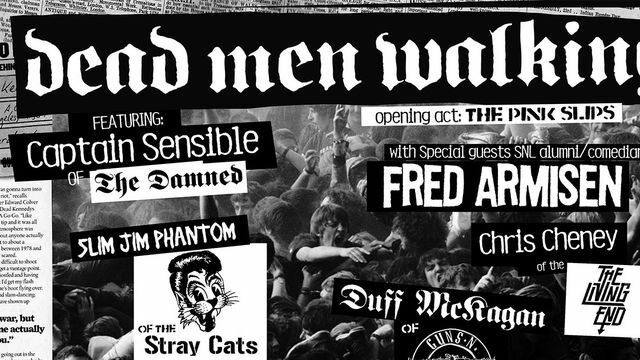 SNL alum and Late Night band leader Fred Armisen has just formed the most ridiculous supergroup; he’s teaming up with members of Guns N’ Roses, The Stray Cats, The Damned, The Living End, and The Alarm to create a giant new band called Dead Men Walking. Just wait — the ridiculousness doesn’t stop there. The group–which is boasts Guns’ Duff McKagan, The Cats’ Slim Jim Phantom, Mike Peters of The Alarm, The Living End’s Chris Cheney, and The Damned’s Captain Sensible–will be playing original material and covers live on September 14 at the Troubadour in Los Angeles with a bunch of special guests promised. Knowing Armisen’s deck, it could be anyone from St. Vincent or Queens of the Stone Age to Paul Rudd or Kristen Wiig. Best of all? Tickets are only $15. Unfortunately this is the only show they have lined up. We hope they play more. If not, at the very least Armisen better try to sell fans in the audience some more flash drives.